Information for the 2015 St. Olaf Christmas Festival "And On Earth Peace"
Northfield, Minnesota welcomes over 600 student musicians for this year's annual St. Olaf Christmas Festival, a 100-year-old tradition deeply cherished in this part of the country, as well as listened to raptly by millions throughout the world. It was over 100 years ago this December when a Norwegian immigrant named F. Melius Christiansen had the idea to bring together students, faculty and their families for an evening of singing and contemplation. Even back then, shopping, travel plans, parties and college finals made this time of year extremely hectic — and the real meaning of Christmas just got buried among long to-do lists. As the years passed — this Christmas program really caught on — in a huge way — it's expanded into a festival of word and music that includes five choirs, a symphony orchestra, five conductors, two pastors and the 4,000 audience members who are invited to sing along — and St. Olaf's festival is one copied by college music programs all over the country. Anton Armstrong is the Artistic Director of the festival and tells me this is much more than a concert — it's a transformative journey. "It's not entertainment, in the sense of Radio City Music Hall. It's not entertainment in some of the grand spectacles that some of the television specials have turned into over Christmas. But what it does is takes very heartfelt words and beautifully crafted scores and asks each of us to open all of who we are — body, mind, spirit and voice — so that we can take in this message anew." That message is simple — "The World Renewed with Love Divine." It's the gift of a child born simply, and humbly, for us and the words and music we'll hear will take us straight into the heart of that message, its meaning penetrating deeply into our souls. 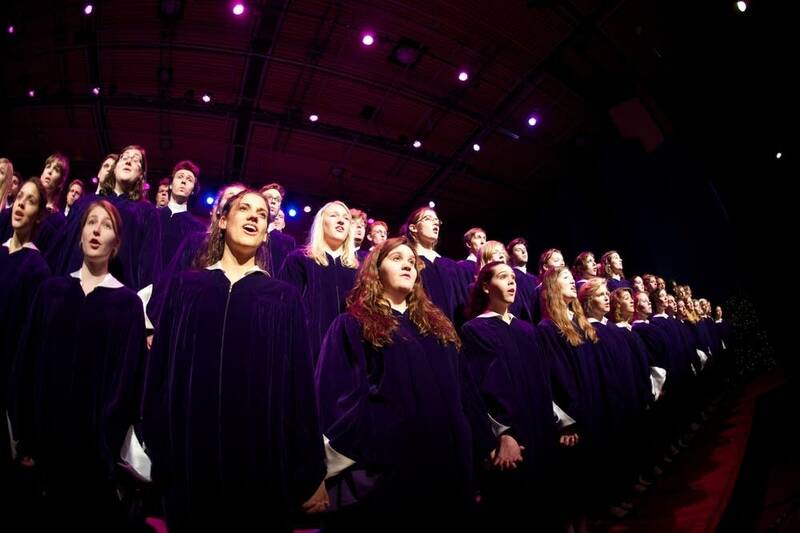 Five choirs perform in the Christmas Festival — including the first-year men's Viking Chorus; first-year women's Manitou Singers; two of the largest choirs at St. Olaf, the Chapel Choir; and the Cantorei, and the famed 75-member St. Olaf Choir, plus the 90 member St. Olaf Orchestra. And the sounds these students create is full of magic — peaceful at times, hushed and contemplative — and then at others so grand, full, like a heavenly chorus. But this magic doesn't just happen. Steve Amundson is the Conductor of the orchestra and he says the minute last year's festival finishes, the faculty sit down and begin planning the next festival. "It's really a team effort. We tend to pick a few pieces that we're excited about doing. And as we look at the texts of the pieces we're doing, our creative energies kick into high gear and we start thinking about words, images and ideas, and in doing so we come up with lots of ideas. We liked the idea of wonder and gift and Christ as the gift to the world and it just conjures up lots of images visual and otherwise." The faculty conductors get the theme hammered out, and pick their songs, and then they have to prepare the choirs, which is not an easy task, especially considering about a third of the students are in their first years and may never have seen the Christmas Festival before. Sigrid Johnson leads an entire choir of first year students — the all-female Manitou Singers — and I just had to ask her, how does she get these girls to sound like angels? "It's called prayer. No, we take them down and show them the space, and we try to let them know what's going on but it's just talk until we are actually doing it. Every time I have an opportunity to with a teacher or student, they talk about process — choosing the music, rehearsing, memorizing, finding the spots for all these musicians on the risers — but in the end, it's the moment itself, one that in the midst of the beautiful music awakens us to the message of Christmas. Anton Armstrong says it the best. "We purposely begin without words to allow the listener to come into their own sphere of influence. And for some it's the wonder as they're surrounded by the choirs and the audience, and then they hear these voices as they process to the stage, and then we start unraveling this message in as many ways as possible and I think every year — those who have heard it forty-some odd times or are hearing it for the first time — seem spellbound and they seem touched."